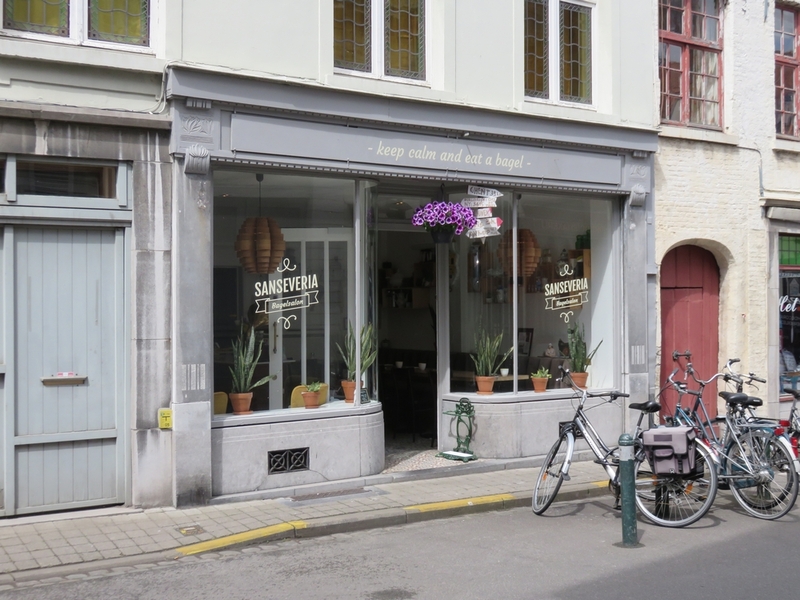 Restaurant review #78 – Sanseveria Bagelsalon is a cosy little place in the city center of Bruges. It’s just a 5 minute walk from the Burg and City hall, and near the famous Rozenhoedkaai, where many tourists align to take that famous snapshot of Bruges’ canals and the Belfry. 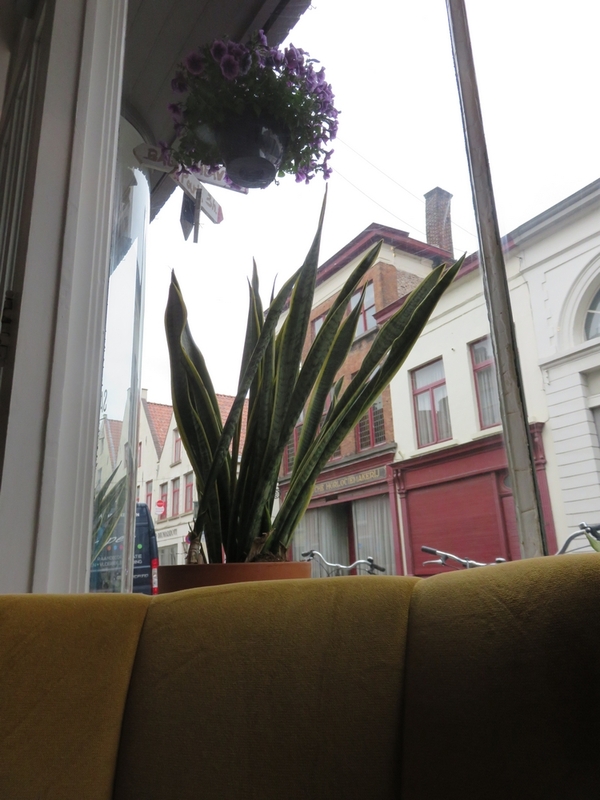 I visited Sanseveria Bagelsalon with a friend a couple of weeks ago. There are no vegan options standardly available on the menu, but upon making the reservation, my vegan friend who had been there before requested vegan for two. Sanseveria is the name of a succulent that used to be very popular in Flemish pubs and househoulds. I also read once that is one of the hardiest plants to stand sigarette smoke, so that may also be the reason why it survived the poor oxygen environment in the pubs in the old days. After being considered ‘old fashionned’ for a couple of years, the plants are now making their way onto windowstills around the country and are now hip again! We inquired about the ingredients of the bagels (bread), but because of the ’emulsifiers’ listed, we couldn’t make out whether they are vegan or not. 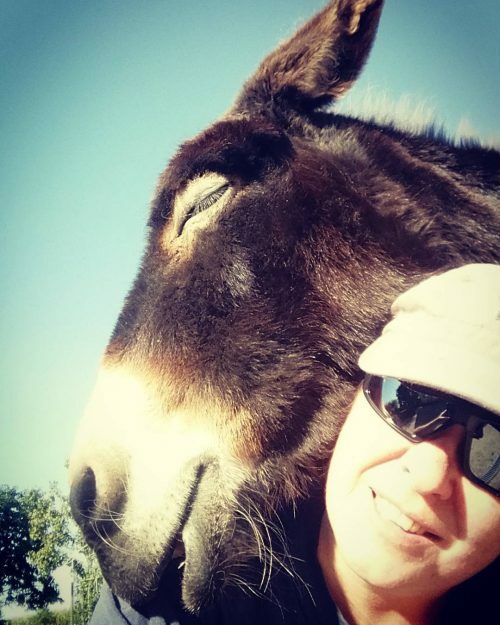 The waiter offered to make us a salad with guacamole and beet tapenade and confirmed that there were no animal ingredients included, neither in the beet tapenade nor the guacamole. 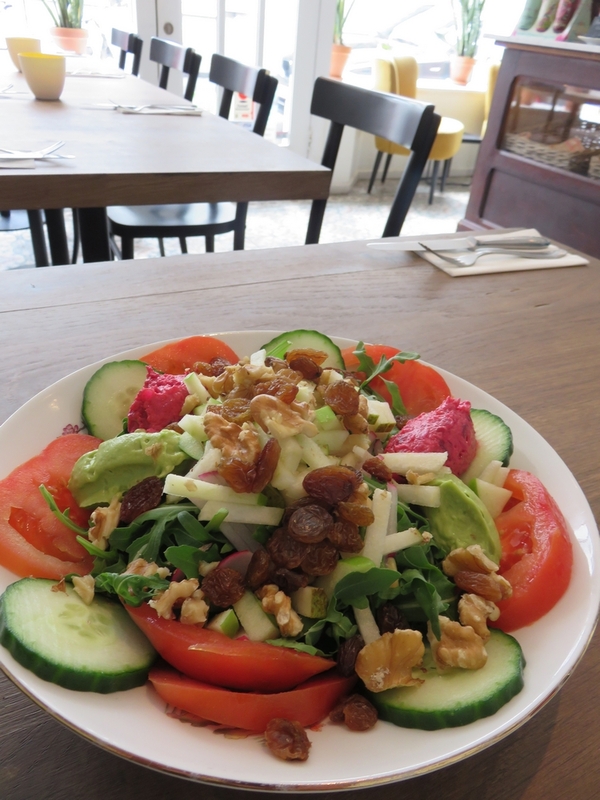 The salad was nice, also contained some nuts and raisins. Some dressing would have made it a bit more enjoyable though. 15,5€ was a bit steep for the salad, but service was very friendly and they had no problem checking for ingredients, which left us with a reassuring feeling. There are not a lot of seating places at Sanseveria Bagelsalon, and tables are placed very closely together (it was not so easy to get out afterwards). 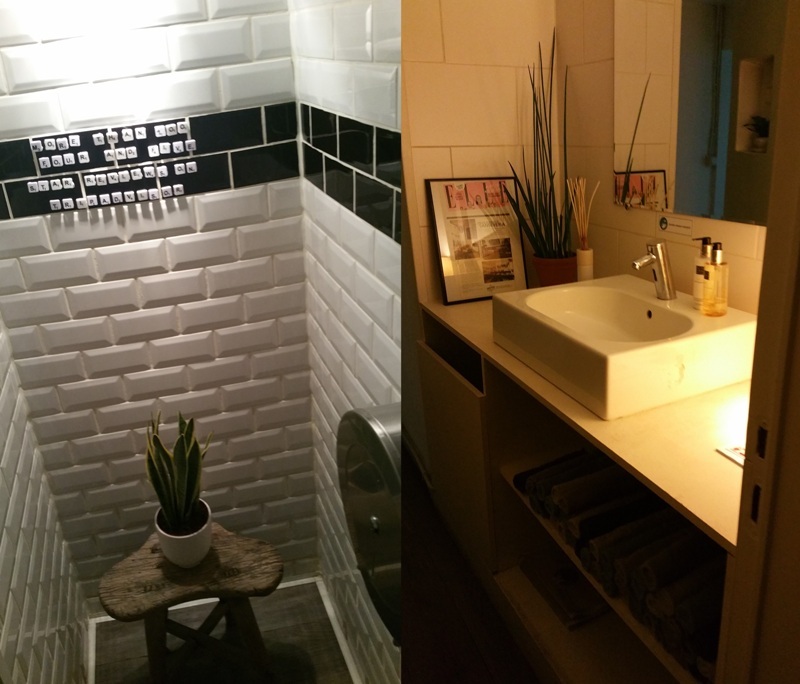 Toilet was clean and nicely decorated. After our visit, I contacted Sanseveria to check the ingredients of the bagels. After contacting the manufacturer, Sanseveria replied that there are no animal ingredients in the bagels, so on a next visit I wil try a bagel for sure! 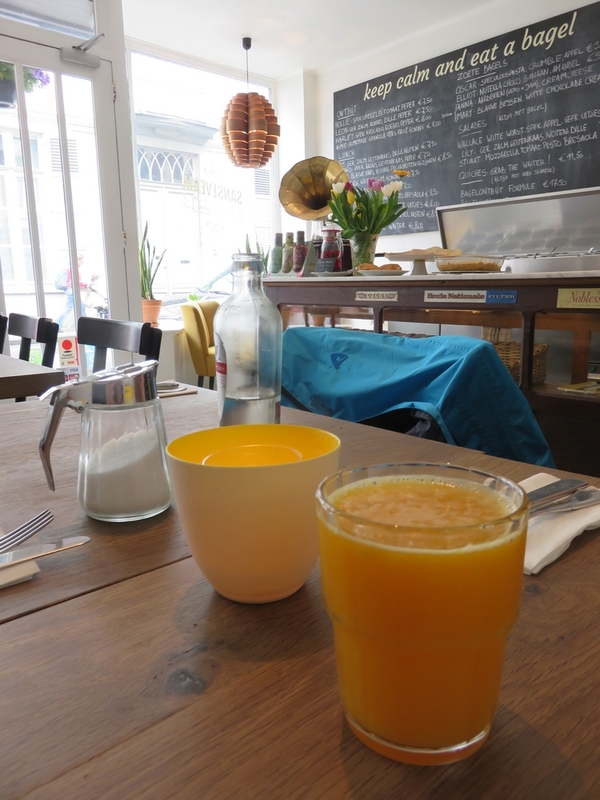 Note: do check opening hours of Sanseveria Bagelsalon! Only for breakfast and (late) lunch. 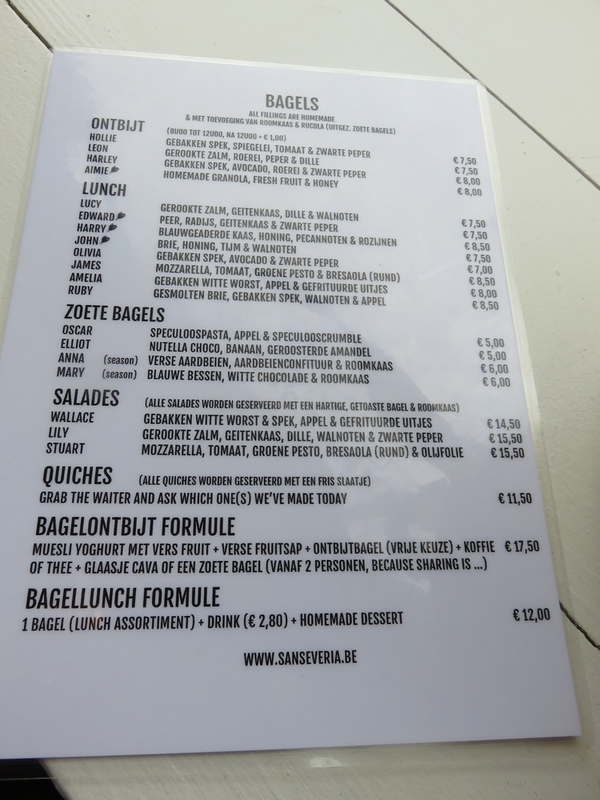 Menu at Sanseveria Bagelsalon: no vegan options available, but willing to make you something vegan!